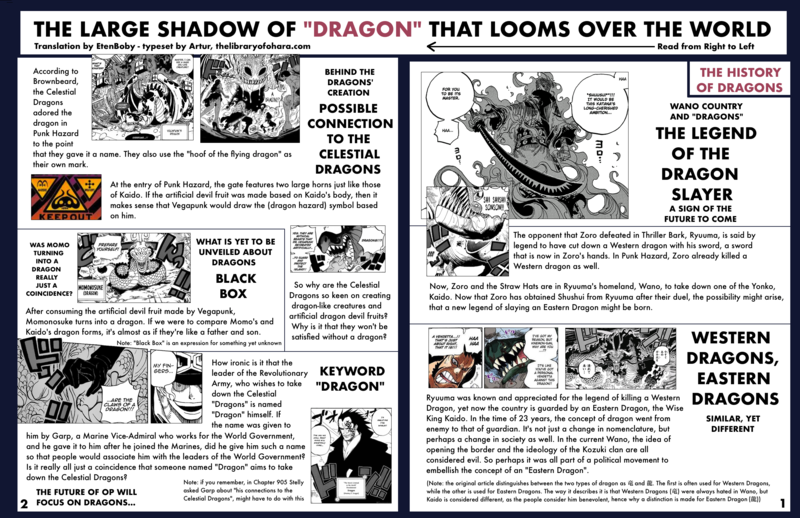 With the 5th volume of the magazine, alongside the Charlottes and a few other things, came a very fascinating article talking about the “dragons” of the One Piece world and teasing about a few things for the upcoming future. The translation was done almost entirely by EtenBoby (I only translated the titles of each paragraph and added notes), so since I can’t confirm everything directly, please take it with at least a grain of salt, as is with these sorts of articles, stuff could always be lost or misinterpreted in translation. If there’s any more little information like this I’ll be sure to add it later. i am saving this for tomorrow LOL! artur-dono great work as usual! I’d like to know what name the Tenryubito gave the dragon of Punk Hazard. Maybe we’ll find out in a vivre card pack. Why are celestial dragons up to artificial dragon type devil fruits? Why could they? Maybe because celestial *Dragons* want to be real *Dragons*?